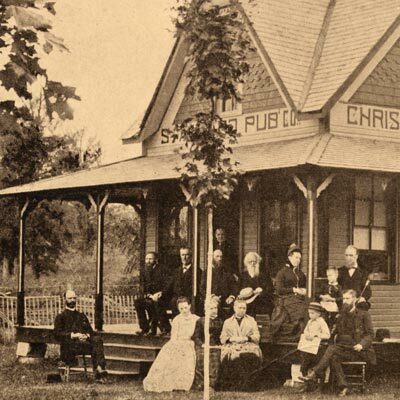 Indiana Historical Society, Jay Small Postcard Collection, Standard Cottage, 1886, Bethany Park, Indiana, Collection No. P0391, image © 2003. Few architectural features evoke more romantic notions or do more to define a building’s historic character than the American porch. The size, style, detailing, and location of a porch can tell volumes about the age and use of a building. Each component, from handrail or baluster to column or post, enhances the architectural character of the porch. Alter or remove the porch and a historic building or streetscape can lose its visual integrity and historic authenticity (Figure 1). Figure 1. Distinctive yet different, these front porches are important features along the street. The rhythm would be diminished if the front porch from one of the houses was dramatically altered or removed. Photo: Aleca Sullivan. Functionally, a porch protects an entrance from the weather. Yet open porches are constantly exposed to sun, snow, rain, and foot traffic, and thus subject to deterioration, perhaps more than other parts of a building. Wood porches are particularly vulnerable. Deferred maintenance and neglect account for the decay and loss of countless numbers of historic porches each year. Deterioration from moisture and resultant wood rot, and damage caused by wood-eating insects are common problems that, when left unaddressed too long, can lead to the loss of significant historic fabric. Inappropriate repairs or insensitive alterations, such as the enclosure of a front porch, can be equally destructive and negatively affect the porch’s appearance. All these things can alter a building’s historic character. To preserve the character of the porch, as well as the historic building itself, it is essential to plan carefully before undertaking any work on a historic porch. This Preservation Brief provides guidance for the everyday care of wood porches on older buildings. It focuses primarily on the maintenance and repair of wood porches, but acknowledges other, often challenging, work as well. 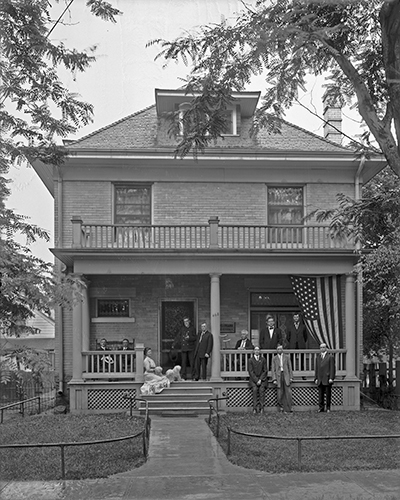 This publication provides a brief history of the American porch and identifies its basic structural and decorative elements. It outlines how to assess the condition of a wood porch, how much work may be needed, and how to develop a specific scope of work. Detailed guidance on each level of work is provided, beginning with routine maintenance, followed by general repairs for various porch components, and concluding with replacement of parts that are beyond repair. Recommendations are provided for work that may require professional assistance. Although the Brief primarily addresses residential buildings, much of the information can be applied to wood porches on any structure. In colonial America, buildings in the northern colonies tended to echo British precedents with small gable-roofed extensions to protect main entrances. Whether open or enclosed, these extensions were called porches (from Medieval English and the French word porche, which stems from the Latin, porticus). Also known as porticos when supported by columns, these covered entrances were sometimes designed to respect classical order and details, especially on more stylish buildings. Hooded doors or small covered entryways flanked by benches, often called stoops (from the Dutch stoep for step) that served as short covered transitions to and from the outdoors were common features, especially in New York and the mid-Atlantic colonies. Figure 2. Porches not only help define the architectural character of a building but also serve as living areas. They can be designed to take advantage of surrounding views. Cedar Grove, the home of the nineteenth-century landscape painter Thomas Cole, has an L-shaped veranda on the front and a two-story porch on the rear, providing an enviable view of the Catskill Mountains. Photo: Marilyn Kaplan. During the late 1700s and early 1800s as longer shed-roofed porches became more common, they were typically called piazzas, as they were then called in England. This term, still popular in some areas of North America, is adapted from the Italian word for open space or plaza. An alternate term for a long open porch, veranda, reflects British colonial design influence from the Indian sub-continent. 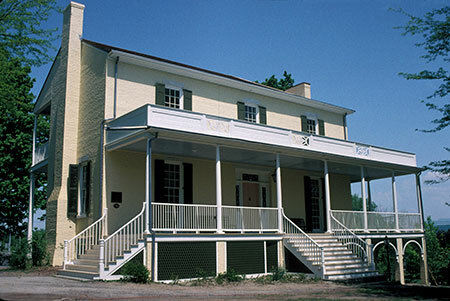 In French colonial areas, such as the Louisiana Territory, houses were often built with broad roofs extending well beyond the exterior walls to form surrounding porches, known as galleries. Porches were also important features of Spanish colonial buildings. In California, for example, many adobe ranches featured a portal with the roof supported by wooden posts. African and Caribbean influences can also be found in North American porch traditions. By the late eighteenth and early nineteenth centuries, porches became more common in larger, wealthier areas such as Philadelphia, Boston and Charleston. In both the North and the South, formal colonnades with tall columns dressed in classical orders were sometimes added to help dignify public buildings, hotels, and mansions. This trend continued through the 1830s and 1840s, as the Greek Revival became the dominant architectural style in many areas of North America. The social role of porches as a transition space between indoors and outdoors and as a link between private and public realms evolved during the 1800s. By offering grand entrances and sheltered landings with views of the surroundings, prominent porches became expected features of inns, hotels and resort spas, where they could serve as promenades, social gathering spots, and refuges for more private retreats. Porches were also added to private homes to serve many of these same functions (Figure 2). As the country began to thrive and expand, porches became more than just covered entrances or ceremonial features; they became an integral part of domestic social life. Figure 3. 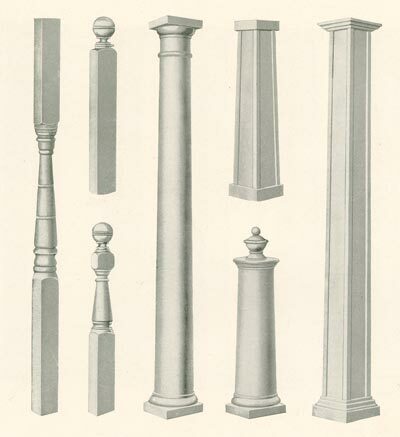 Throughout the late nineteenth and early twentieth centuries, millwork catalogues offered a wide variety of designs for porch parts, including columns, newels, balusters, spindles and brackets. As extolled in the Cedar Rapid Sash & Door Company's Standards Design Book, stock parts made embellishments to porches affordable both for new construction and "updating" existing homes. Courtesy of Charles Fisher. Some of the most significant factors that aided this shift were America’s industrialization and later suburbanization. As improvements to mass production methods helped spur industrial growth, many Americans had more money to spend and more leisure time. Meanwhile a growing middle class was moving to new suburban neighborhoods. Inspired by the pattern books of Andrew Downing and George Woodward and the published designs of such architects as Alexander Jackson Davis and Calvert Vaux, the homes of these mid-1800s suburban neighborhoods were typically ornamented by elaborate porches dressed with fancy millwork. By this time, millwork catalogues and builders’ pattern books offered a wide variety of designs for porch parts. With mass production, these fancy brackets and other ornamentation became less expensive, making it easier and more affordable to construct decorative porches (Figure 3). With mechanized wood turning lathes, the cost of posts, balusters and decorative spindle work also decreased to a level affordable by many. Adding a porch with wood ornamentation could enhance even the smallest and simplest of houses. Even older homes could be modernized with a fancy porch addition, stylized to the latest fashion trends. Such changes culminated in the large, highly decorated wrap-around porches of the Queen Anne style. By the early twentieth century, the hygiene movement, which stressed that access to fresh air could help prevent or remedy such diseases as tuberculosis, contributed to the development and proliferation of the sleeping porch. These porches were usually located on the second floor next to bedrooms. This era also saw the rise in use of insect screening on porches to guard against the discomfort of mosquitoes and the diseases they spread, such as yellow fever and malaria. While innovations fostered the proliferation of porches in the nineteenth century, new inventions helped lead to its decline in the twentieth. As the automobile boom of the early twentieth century made it easier for people to get out of the house for entertainment and relaxation, porches began to lose popularity, especially as architectural styles and social attitudes changed. With the telephone, neighbors and friends could chat without personally meeting. And housing styles popularized in the construction boom after World War II often omitted front porches all together as backyard patios became the focus of private outdoor activities. Finally in the mid-twentieth century the broad availability of air conditioning and television enticed many people to stay inside at night and brought the golden era of the American porch to an end. In preserving historic buildings, it is important to understand the history and evolution of a particular structure and what features contribute to its historic character. This is especially applicable when working with historic porches since they usually are prominent features, significant to the character of a building. Answers to the following questions will help establish the significance of a porch. What has the porch looked like in the past? Early photographs, insurance maps, or tax records can provide useful information. These may be found at city or county offices, historical societies, libraries or even from former owners or neighbors. Such documents may indicate the footprint of the building or show long-lost details of the building’s appearance. Physical evidence of historic porch footings may exist. 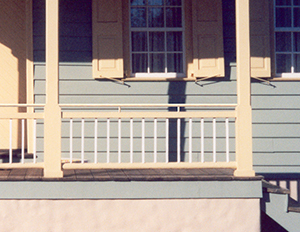 Paint shadows of a former roofline or moldings can provide clues about details now missing. Old porch parts may have been “stored” under the deck during past repairs. What, if any, changes have taken place to the historic porch over the years? On many porches elements such as columns, balusters, and finish details correspond with the design and detailing on the rest of the house. With other porches, the style of these features may differ from the rest of the building, but may reflect an important chapter in its history. Sometimes, parts of porches may have been lost due to neglect or remodeling. Questions about what historic fabric remains, what has been altered over time, and whether earlier changes are now an integral part of the historic character should be resolved before planning major porch work. Determining the historical evolution of the house may require both physical and archival research and in some cases the professional eye of an architectural historian. What are the character defining features of the porch? The open qualities are one of the key features of most historic porches. Overall size, shape and design are obviously important components as well. There are numerous other contributing features which may exist, including the shape of the porch roof, the way a large porch is divided into distinct bays as with columns, the nature of the supporting foundation, the style and size of columns and balustrade, and whether the porch is raised or largely at grade. The simplicity of a porch or its richness in detail will also help define it. 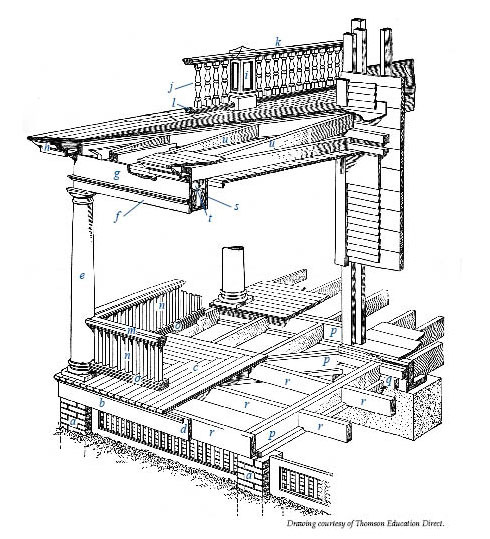 Materials are usually important as well, not just the wood features, but also whether other materials exist such as masonry columns and steps (Figure 4). How does the porch contribute to the building’s overall appearance? The size and location of a porch and how much of the historic features survive will help define its significance. A highly ornate porch across much of the front facade may be the most distinctive feature of the entire house, while a small simple porch on an otherwise plain cottage may be equally significant. The architectural style of a porch may relate to the building and may help define its character. Sometimes a later style porch may have been added to a building or may have replaced an earlier porch. In such cases, the later porch may have acquired importance in its own right. On the other hand, a later porch may be of such poor quality that it detracts from the building’s historic character. Because porches are so diverse in terms of style, size, shape and detail, their significance should be assessed on a case-by-case basis with an understanding of the overall importance and evolution of the building. Figure 5. Even historic porches that appear to be in total disrepair may be repairable. While the roof needed replacement, much of this porch was repaired, including such features as the decorative columns, ornamental brackets, and balustrade. Photos: John Leeke. Before undertaking most repairs, it is important to assess the condition of the porch. The assessment is greatly facilitated if the porch has been regularly maintained and a record of past work is available. In most cases, however, a condition survey must rely almost exclusively on the physical examination of the porch, documenting the findings with notes, photographs or sketches. How is the porch constructed? A porch is rarely an independent, unattached structure. It may, however, have its own foundation, attached to the house only along the deck and the roof. Alternatively, it may be an included or engaged porch that is integrated with the actual structure of the house. The relationship between the porch and the house is important. If the outer support posts are decayed or if foundation piers are sinking, the roof structure may be pulling away from the house. Many porch decks are fastened to the main building on a ledger, a horizontal board along the house’s foundation. A decaying ledger may compromise the structural integrity of the porch and can represent a major safety issue. Are the foundation and structural members of the deck sound and providing adequate support for the deck, posts and roof above? The porch structure needs to be sound at every level. Therefore, a visual inspection of the underside of the porch is necessary to determine its condition. Major cracks in structural members, failed joints, significant wood rot, or evidence of widespread insect infestations (termites, carpenter ants or powder post beetles, for example) are usually signs of serious structural damage. Such conditions may require consultation with a professional architect, engineer or building contractor familiar with old buildings. For an adequate assessment, it may be necessary to remove facing boards to check for potential decay in the structural sill behind (Figure 5). What is the condition of the porch? Porch foundations may be a continuous wall of masonry, a series of masonry or wood piers or metal pipes, or a combination of these. Missing sections of the foundation, crumbling masonry mortar joints, or areas where the sill or joists no longer fully rests on the foundation may represent serious deficiencies. What appear to be deep foundation footings may only be stones or cement blocks sitting on top of the ground. The footings must be stable enough to adequately support the porch in its current or intended use. The smell of mold or appearance of fungal growth on wood beneath the porch is an indication of deficient air circulation and that conditions exist for wood decay. Recent changes that can contribute to deterioration should be identified for correction, such as a clothes dryer vent dumping warm moist air underneath the deck. The enclosure of original air vents in crawl spaces or the boarding up of latticework between piers are other changes that will usually promote an unwanted moist environment. Figure 6. A traditional way to extend the life of porch posts was to place posts on metal feet, thereby providing a separation between the wood post and wood deck. This helped to prevent the wood post from rotting at the base. Early post feet were simple iron bars bent unto a stirrup shape. By the late nineteenth century manufactured cast-iron feet were common, consisting of a pair of disks separated by a short pipe. Post feet are still available today. Courtesy of Old-House Journal/Brian McNeil. Are the porch posts providing adequate support? Posts, pillars or columns usually help support the porch roof or an upper deck. Establishing what the posts are made of and how they are constructed will aid in understanding how they function and may deteriorate over time (Figure 6). Although the posts on a wood porch are commonly made of wood, they may be of masonry or metal or a combination of materials. Large round columns usually are made of wood staves similar to the way barrels are constructed; smaller diameter columns may be solid. A sag in the deck below or a faltering foundation can impact the supporting role of a column or post above. Wood columns and posts are prone to water seeping into open joints, particularly in the base and the lower end of the shaft. It is not uncommon to find that older columns have had patches and replacement bases. Is the roofing and drainage system keeping the water away from the porch? Porches were designed to shed water. This means water will move away both from the building and the porch and not pond and saturate the wood. Continuously high moisture levels promote fungal growth that eventually causes wood to decay. Peeling paint on ceiling boards in a specific location is a sign of a possible roof leak. Clogged or missing downspouts and gutters can cause erosion at the foundation and can contribute to reverse-grade draining that is directing water under the porch instead of into the yard. Inadequately sloped porch floors can result in improper drainage and promote deterioration as exhibited, for example, by cupping floorboards. What is the flooring condition? The porch component most subject to decay is the flooring. Often decay starts at the exposed ends of the boards or where cracks, checks or open joints have occurred and are exposed to the weather. Flooring should be checked frequently for peeling paint, rotted wood, and for loose, cupping or splintery boards. Where water is ponding, there is insufficient slope away from the building, a condition that should be corrected. Floor deterioration can also start in unlikely places such as the result of frequent hose washing to remove dirt or the placement of plant stands directly on the floor without proper moisture barriers. Firewood stored on a porch may trap moisture on the floor and harbor active insect infestation that can be ruinous to a wood porch. Thick floor mats and carpeting also may trap moisture, leading to premature decay. Is there evidence of general wood decay? Wood deterioration may take different forms such as fungal decay, insect infestation or even sunlight degradation of exposed unfinished wood. Decay may be present where two wood surfaces meet and are not adequately protected from water, such as along open joints or behind moldings. Dark streaks, discoloration, and widespread peeling paint on a finished ceiling suggest excessive moisture or water leakage. It may be necessary to remove several finished boards to properly identify the cause of the problem and to insure damage has not extended to structural members behind. Trails of carpenter ants are another sign of potential decay since they will infest moist decaying wood. Where inadequate painting has left wood exposed for a long time, damage to the wood surface from light itself will occur, typically indicated by wood discoloration. Without sanding or scraping back to a sound wood surface, repainting will result in premature failure of the paint film. Figure 7. Common problems with porches that can contribute to serious wood decay include cracks in woodwork and joints that have opened up. Both provide an easy path for water seepage. Trapped moisture can foster peeling paint, wood decay and insect infestation. Open joints and cracks should be checked for evidence of more serious decay and marked for caulking or repair. Photo: John Leeke. Are there open cracks or joints in the woodwork? Tightly sealed connections keep water out. Where individual boards come together, cracks in woodwork and joints can eventually become a major problem (Figure 7). Cracks are primarily caused by movement and water penetration. Movement of structural members beneath the finished woodwork can shift the position of individual boards and trim, breaking open the thin coating of paint over joints. This condition is common on porches with shallow foundations that are subject either to annual winter frost heaving or where soil conditions undergo major seasonal changes in moisture content. Changes in the moisture content of the wood itself due to repeated wetting and drying or changes in seasonal humidity can also cause noticeable expansion and shrinkage across the width of a board. This provides opportunities for water to penetrate unprotected areas. Does peeling paint indicate deeper problems? An unbroken layer of paint covering all wood surfaces is the first line of defense against moisture causing decay. Over time, even hairline paint cracks can allow water to penetrate, causing paint to peel down to bare wood. Such peeling occurs near breaks in the film, at opened joints, or where the paint has been scratched or scraped. Peeling can also occur over large areas where there is high moisture and insufficient ventilation. Areas of particular concern include the crawl space beneath the porch deck, inside columns that lack ventilation, and in a roof structure that has a finished ceiling and lacks ventilation. If heavy paint build-up exists on columns, floors and trim, moisture can be trapped within the wood, resulting in the loss of paint adhesions and eventual wood decay. Are trees, shrubbery and flowerbeds threatening the porch? Shade trees can make the porch a cool oasis, but the branches of a nearby tree rubbing on the roof, gutters or wood trim often will cause damage. Tree roots may destabilize porch foundations or supports. Bushes growing against the porch and not trimmed back on a regular basis may block wood porch components from drying breezes, thereby letting moisture build up in the woodwork. Flowerbeds and mulch around the porch that are not properly sloped downward in a grade away from the house will promote moisture problems. Once the historical and physical assessments are complete, it is important to define the scope of work. How much and what kind of work will need to be done to make the porch structurally sound while preserving its historic character, or to recover its historic appearance if portions are extensively deteriorated, altered or missing? Any part of the porch that defines its historic character should be repaired or replaced to match. Since the porch may display varied levels of deterioration, the spectrum of work in one project can include maintenance, repair, and replacement. When laying out the scope of work for the project, each individual component and decorative element of the porch should be identified, and linked with the work needed for that item. The highlighted work approaches in this section are based on The Secretary of the Interior’s Standards for the Treatment of Historic Properties and the Accompanying Guidelines for Rehabilitating Historic Buildings. The Standards and Guidelines provide a sound philosophical and practical framework for achieving the highest retention of historic materials and character possible. Thus, the familiar hierarchy is applied: maintain, repair, and then replace only if necessary. Contemporary alterations are discussed in a separate section. There are a variety of tasks that can be done on a regular basis to extend the life of a porch. In addition, a visual inspection of the porch should be made every spring and fall to determine if more in-depth repairs are necessary. Fortunately, ongoing maintenance significantly reduces both the need and cost for later repair work and represents good preservation practice. When properly maintained, a well-constructed porch can last for decades. Since many porches are essentially another living space, extending housekeeping to this space makes practical sense. Regular maintenance includes sweeping the wood porch decking, and, if needed, an occasional damp mopping. Removing dirt and leaves by sweeping is preferable to frequent hosing off the deck with water. The latter can saturate the woodwork, thereby promoting decay. Frequent sweeping will reduce the accumulation of abrasive materials, such as dirt and sand. While visually pleasing to some, vines and plants should be kept trimmed away and not be trained to grow onto or allowed to grow beneath porches. Plants and vines unfortunately reduce ventilation, promote a moist environment for insects and decay, accelerate open wood joints and impede cyclical maintenance. As an alternative, traditional freestanding trellises can be used to support plant growth away from the porch. There are certain precautions that are recommended for wood floors. Rubber mats, rugs or indoor/outdoor carpeting can trap moisture and condensation on their underneath side and should not be used on a wooden porch floor. Keeping flower pots up off the wooden deck will help prevent moisture buildup and decayed spots – wood, clay or metal “trivets” that hold the pots an inch or more off the wooden deck are helpful, but the pots should be moved to different locations periodically. In colder climates, light snow can be swept off the porch. Snow shovels with a hard rubber leading edge or plastic shovels cause less damage to wood than metal, while paint in good condition helps ice to release more easily. Sand or clean kitty litter can be sprinkled on ice to prevent slipping; however, they should be later swept off the porch, as they are abrasive. Salt (sodium chloride) is not recommended for ice removal on older porches as it can promote corrosion and failure of nails and other fasteners. Magnesium chloride is an alternate de-icing salt that is less corrosive and less damaging to masonry and plants. If any de-icing salt is used, be sure to scrub and rinse off the porch deck in the spring. Boot scrapers and brush-mats at the bottom of the stairs are recommended for muddy areas. Figure 8. Decay can start when wood is left exposed to the weather or where joints open up. An inexpensive way to extend the life of the existing porch paint without jeopardizing the historic material is spot paint and caulk where needed every year or two. This cost-effective procedure is particularly effective in maintaining wood porches where the exposure to weathering is high. Photo: John Leeke. Spot painting and resealing of open joints should be undertaken at least every other year (Figure 8). Heavily used stair treads may require more frequent paint touchup. When peeling paint or bare wood is evident, inspect to ensure it is not signaling deeper problems, such as decay. With sound wood, scrape off the loose paint, sand, prime, and repaint the area. Where lead paint is present, appropriate lead hazard precautions and procedures apply. Only top-quality exterior primers and paints are recommended, selecting for the deck and stairs specially formulated paints. 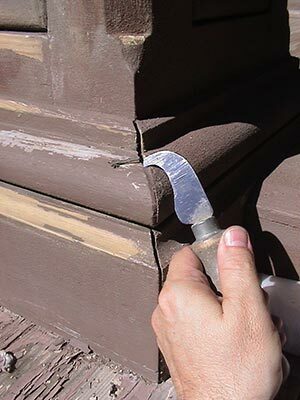 Where wood porch steps are exposed to moisture, grit added to the wet paint during application will help improve safety. Many repairs may be successfully undertaken by property owners, while major projects often require the special knowledge and equipment of an experienced contractor. Repairs generally include patching and reinforcement of historic materials. The roof and foundation are particularly important to the preservation and the structure of a historic porch yet they often receive much less attention than ornamental features. Their neglect will usually lead to more costly work. Repairs to features such as a balustrade or flooring can encompass limited replacement in kind when the porch part is severely deteriorated or when a part of a repeated feature is missing altogether. Some common porch repairs are discussed in this section. To seal open cracks or joints, start by scraping off the paint back a few inches from the opening and removing old caulk to expose bare wood. 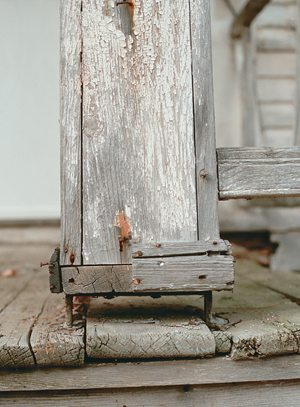 The opening should be examined for any signs of wood decay, and to determine if the joint is loose due to a loss of connection, such as rusted nails. After correcting any problems, apply a water-repellant wood preservative that can be painted. Such preservatives are either an oil-based or waterborne solution of oils or waxes with mildewcide, fungicide and pesticide added. Then apply a high quality exterior wood primer to the wood surfaces where a sealant or caulk is to be used. Most open cracks or joints then can be filled with a sealant or caulk, while larger ones may need the addition of a backer rod. In some cases, small metal flashing over the crack or open joint may be more effective and longer lasting but, when used, care should be taken with proper installation. The final step is painting. Figure 9. 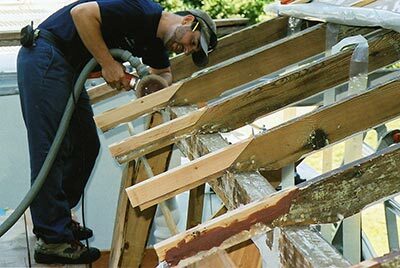 The ends of porch roof rafters are often susceptible to moisture decay. When concealed by a soffit or ceiling, rafters can be repaired by adding new sister boards. Where roof rafter ends are exposed, splicing new wood onto the old (dutchman repair) and use of epoxy consolidants and fillers both preserve sound historic fabric while retaining the historic appearance. Photo: Paul Marlowe, Marlowe Restorations. This traditional technique is often used to repair localized cases of decayed wood and, when undertaken with skill and care, will serve as a permanent repair (Figure 9). If the damaged area has a structural function, temporary bracing or other support will be necessary. Otherwise the first step after removing any paint around the damaged area is to chisel or mechanically remove the decayed wood. It is best to use the same type of wood being replaced and the new or recycled wood should be seasoned to avoid shrinkage. The repair procedure involves cutting a piece of wood, called a dutchman, slightly larger than the area of damage that has been cut out. The dutchman then is laid over the damaged area and an outline scribed into the original wood surface below. Next, a chisel or router is used to follow the scribed line to form an opening in the existing wood for the new piece. As a preventive measure, an appropriate fungicide should be applied to the surrounding old wood and allowed to dry. The dutchman is then glued into place with waterproof adhesive, such as an epoxy formulated for wood. The repair is finished by trimming or sanding the surface of the new wood down flush with the surrounding existing surfaces, priming and painting. There are a variety of commercial wood fillers. Cellulose based fillers consist of wood fiber and a binder and have been available in stores for many years. Only those suitable for exterior applications should be used and they will require a protective finish. Epoxies are a more contemporary product, commonly used by experienced contractors and woodworkers. Epoxies are petroleum-based resins created by mixing two components in accurate proportions that result in a chemical reaction. The result is durable, moisture-resistant consolidants and fillers that bonds tenaciously with wood, and can be sawn, nailed or sanded. Epoxies are for use only in areas that will be painted, as they do not take stain and deteriorate under sunlight. Since epoxies are more difficult to work with than other wood fillers, experience working with epoxies is needed for successful repairs. Balustrades and railings are not only practical and safety features, they typically are highly visible decorative elements. Unfortunately, balustrades and balusters are frequently altered, covered, removed or completely replaced even though in most cases they can be repaired in a cost-effective manner. To preserve historic fabric, the repair of old balustrades and railings is always the preferred approach. A broken baluster usually is one in need of repair, not replacement. Loose railings and balustrades present unsafe conditions and need to be repaired as soon as possible. Start by examining the points of attachment to determine exactly why the railing or balustrade is loose. Common reasons include rusted fasteners, decayed wood, or physical stress that has broken the fasteners or split the wood. Paint and decayed wood must be removed. Where fasteners are broken yet the wood is sound, the balustrade can be re-fastened using hot-dipped galvanized or stainless steel nails or screws, setting the heads of the fasteners below the surface of the wood and using a wood filler to cover and seal. Next repair deteriorated wood by using a dutchman or wood-epoxy repair. The repaired joints then can be sealed and painted. The balusters help comprise a wood balustrade and come in three general styles: simple rectangular shape; flat, pattern-sawn (usually a board with some decorative edge or cutout); and turned. It may be necessary to replace certain balusters that are beyond repair or missing altogether. Some are easy to replace with new matching balusters while others can be more challenging in terms of both design and costs. Finding or affording replacement balusters may take time since they should match the historic baluster as closely as possible. In the meantime, unsafe balustrades can be temporarily stabilized, introducing temporary new material that soon will be replaced. In replacing individual balusters, simple, rectangular balusters should not be replaced with pattern-sawn or turned ones unless physical or pictorial evidence survives which indicate they previously existed historically on that particular porch. Such an alteration can change the historic appearance of the porch or be incompatible with the character of the building. Determine the size and shape of the missing balusters either by examining adjacent ones or temporarily removing an existing baluster as a sample. Heavy paint buildup should be removed so that the original dimension can be established. Scrape and clean the joint locations and make repairs to any deteriorated areas. A new baluster is then fabricated to match the original in design and material, either on site or by taking a drawing or sample to a local woodworking shop. The new baluster should be made one-half inch longer than needed on both ends. Measurements are taken from the bottom surface of the top rail to top surface of the bottom rail. Joints on the new baluster can be laid out with a pencil, using a sliding bevel to transfer any angles, and the new baluster trimmed to fit with a handsaw. 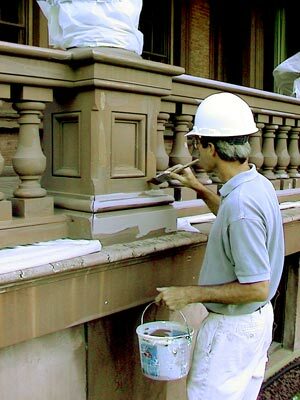 After test fitting, the ends and any exposed end-grain of the baluster need to be sealed with a high-grade primer or epoxy. Next, apply a paintable water-repellant coating to all exposed wood surfaces, and apply a primer. The baluster can then be fastened in place with hot-dipped galvanized or stainless steel nails, and the nails set. Finally, seal joints and fastener holes and paint the baluster. Figure 10. This nineteenth century porch column is made of wood staves, similar to the way a wood barrel is put together. After replacing the torus and making dutchman repairs to the apophyge along the base, the column and pedestal are ready to be reinstalled on the porch. Photos: NPS files. Columns not only enrich the historic character of the porch, they provide support for the roof structure above. Because of their detail and complex construction they can be costly to repair or replace, making maintenance and minor repairs important. 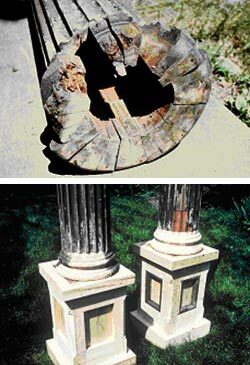 Column plinths and bases tend to deteriorate because of their exposed location on the outer edge of a porch (Figure 10). Leaking gutters can result in water draining into the entablature and down into hollow columns, while clogged or capped gutters can allow water to pour down and splash back onto the column bases. Open joints and limited wood decay can be repaired using methods previously discussed. Column repairs usually are undertaken by an experienced carpenter, since it may involve structural support of the roof above. Floors should slope down toward the outer porch edge for proper drainage. If drainage is inadequate, moisture buildup will cause deterioration of the floorboards. Flooring can also deteriorate due to movement in the supporting structure below. If a floorboard is soft or broken, the extent of decayed or split wood can be determined by probing gently with an awl. The existing floorboard can then be removed, cutting the length if needed so that the end will center on the next nearest joist or girder. Once the board has been removed, the structural framing beneath should be examined for deterioration and to ensure it is sound. A new floorboard is then cut to length, and the outer edge shaped to match the adjacent boards. After priming the replacement board, nail it in place and repaint. If a section of the ceiling is deteriorating, it is likely that there is a roof or gutter problem. To determine the cause of deterioration, inspect the ceiling, gutters and roof, including the internal roof structure. After making necessary repairs, the ceiling boards can be repaired in much the same manner as a deteriorated floorboard. With roof leaks, the entire porch is at risk. Leaks can promote decay in roof rafters, ceiling joists, and columns as well as in areas more easily to detect such as the ceiling and fascia. Inspect the roof covering, gutters and flashing for deterioration and improper performance. They can then be repaired or replaced, as needed, to keep water out of the structure. Avoid having the gutters and downspouts on the main roof drain onto a porch roof. Unstable foundation supports can cause serious damage to a historic porch. There are numerous causes and solutions. If the posts supporting the porch deck rest on stones or brick set directly on the ground, there can be seasonal shifts due to the changing moisture content of the soil or freeze/thaw conditions that will require regular attention. Under certain conditions, it may be advisable to extend footings for the posts below the frost line. Where moisture problems exist, improved drainage may be necessary. It is not uncommon to find that masonry joints in the foundation wall or piers have deteriorated as a result of rising damp, where moisture from the soil percolates up through mortar joints. This condition may lead to the eventual breakdown of the mortar and even old brick and soft stone. In such cases, it will be necessary to replace the areas of damaged masonry and repoint the mortar joints. With wooden posts, insect damage or rot may necessitate corrective measures to strengthen the foundation. Techniques can include one or more of the following: epoxy consolidation; dutchman repair; or the addition of supplemental supports to the foundation posts and joists. In some cases damage may be extensive enough that the only real solution is rebuilding the foundation. The apron, skirt, or latticework is a highly visible and functional porch feature. An apron keeps animals out from under the porch, while at the same time allowing air to circulate, preventing unwanted moisture buildup. Aprons typically are made up of a wood frame, surrounding either a simple lattice or a repetitive pattern of decorative sawn boards. Because the frame is so close to the ground, decay is common. Other causes of decay include plantings around the house that are growing too close to the latticework and improper water drainage. An apron may require partial or complete disassembly for proper repair. One or more of the apron frames should either be hinged or secured with turn buttons for easy access to under a porch for inspection and maintenance. When individual porch parts are deteriorated beyond the point of repair or missing altogether, replacement is necessary. To retain the historic character of the porch, the replacement parts should match the historic component as closely as possible in material, design, color, texture, and other qualities. To achieve this, existing evidence of the historic design, such as a baluster or column detail, or a tongue and groove floor design, should serve as a pattern for the replacement part. When replacing an element, it may provide a good opportunity to upgrade the wood to another species that is more decay resistant, or to one with a vertical grain that is more resistant to cupping or splintering. In limited cases, it may be appropriate to use a substitute material for the replacement material as long as it conveys a close visual match. Before replacing a deteriorated historic porch component, it is important to understand how it was constructed and installed, and what lead to its deterioration. If the replacement part does not sufficiently match the historic part, the character of the porch may be diminished, or even lost. If the cause of material failure is not addressed, the replacement will also fail. If a large section of the porch floorboards is deteriorated, the framing beneath may also be damaged and should be assessed. Replacing floorboards can often expand into repairing the structural sills, girders, and joists beneath. Complete floor replacement will likely require the removal of floorboards that are under structural posts or columns. This may necessitate the careful stabilizing in place or the removal of the posts or columns and the installation of temporary support for the roof structure. If the floor failure was caused by inferior wood, the wood quality can be improved at this time. However, the new wood flooring should match the existing in thickness, width, shape and texture. The slope of the floor should be maintained, or a slope may need to be created if none exists. A slope of ¼ inch per foot or greater, away from the house, is needed for adequate drainage. Boards are usually laid in the direction of the slope, sloping down to the outer edge of the floor. Figure 11. The lower shaft of the porch columns had decayed as water wicked up through the end grain (top). The column shafts were repaired in place by cutting out the deteriorated wood and making repairs using epoxy consolidants and fillers. (bottom). The column bases were replaced. Photos: Paul Marlowe, Marlowe Restorations. Porch stairs receive heavy usage and are close to the ground, making them predictable candidates for deterioration. Stairs should be repaired or, if necessary, replaced by an experienced carpenter who understands the safety codes and is experienced in fabricating custom stair parts to match original detailing without depending only on store-bought parts. When plinths and bases are deteriorated beyond repair, they can be replaced without replacing the column shaft, which may still be in good condition or require only minor repairs at the bottom. Such replacement will involve temporary shoring for the roof. One-story columns and shafts are often more easily removed during this work, while taller columns are sometimes supported in place. If only a few plinths or bases are deteriorated, it is often economical to have new ones made of wood to match. If numerous plinths and bases are deteriorated, replacing with bases made of rot-resistant materials can make economic sense; however, care must be taken to ensure that all the visual qualities including design, size, shape, color and texture of the historic part are matched (Figure 11). Entire columns may need to be replaced, but an owner should first consider all repair alternatives. Some contractors routinely recommend complete replacement of one or all columns due to the challenge of a clean repair (particularly with stave-built columns), or because they see the potential for more profit in complete replacement. If a contractor recommends complete replacement, other opinions should be sought to ensure repair is truly not feasible. Preserving the historic appearance of old columns is not the same as preserving historic columns. Where a replacement turned or staved column is needed, a local millwork may be able to match the profile or pattern. Alternatively, the Internet is helpful in identifying potential sources of replacement columns that can match the appearance of the remaining ones. This table summarizes the characteristics of just a few of the different species available, including the workability of the wood (indicating a better wood for decorative porch pieces), the resistance to decay (an important feature for all porch components), resistance to cupping (a wood highly resistant to cupping is a better choice for floor board replacement) and paint holding ability. The Cut or Grade is also listed, as a low-grade wood can perform very differently than a higher grade in the same species. Cost will vary depending on region and market supply and demand. In general, it is best to contact two or three local lumberyards to find the available woods with the characteristics needed in the local market. Source: Practical Restoration Report, Exterior Woodwork Details. When selective replacement is necessary, the key to success is the selection of suitable wood. Dimensional stability, decay resistance and paint holding ability are wood characteristics that effect durability. Wood that expands and shrinks too much can cause paint to crack. Substances found naturally in certain kinds of wood repel fungi and insects that destroy wood. Selecting wood that is relatively stable and naturally decay resistant helps avoid problems. The wood from trees cut one and two centuries ago was much different than most wood available today. The mature trees in older forests grew very slowly and, as a result, the annual growth rings were very close together. Today, trees grown by commercial companies for their lumber are fast growing so they can be harvested sooner. As a result, commercially farmed trees have annual growth rings much further apart, resulting in the cut lumber being less strong and decay resistant than older timber. These differences in quality are one of the reasons it makes sense to save old wood when possible. Wood Selection: When choosing wood for repair and replacement work, the species, grade, grain and environmental impacts should be taken into consideration. This is especially applicable to historic porches because of their high exposure to the weather and vulnerability to decay. The best species are those with good natural resistance to decay, such as redwood, cypress, cedar or fir. A clear (knot free) grade of wood is best; however, if clear wood is not readily available or too expensive, a grade with small or tight knots is acceptable. Finally, the use of more stable vertical grain lumber is preferable to flat grain boards. Vertical grain lumber expands and contracts less with changes in moisture content, resulting in reduce warping and checks. Paint thus will hold better. The downside to using vertical grain boards is the cost, which tends to be as much as two to three times the price of flat grain lumber in the same grade and species. However, this expense is typically recovered through lower maintenance costs over the years. Thus, a decay-resistant, high-grade, vertical grain lumber is the best choice for the replacement of deteriorated porch elements, particularly flooring, stairs and milled elements such as balusters and moldings. The best species to choose will vary depending on the region the house is located. For example, in the South, cypress is more available, making it the selection of choice in the region. Because of this wood’s relative ease with which a carpenter can shape it, cypress is a good choice for replacing brackets and trim boards on a porch. In contrast, vertical grain Douglas fir is less workable, but is a very good choice for the replacement of porch floorboards in most climates. Although Douglas fir is from the Northwest, it is generally available throughout the country. For most protected trim boards on porches, white pine is a good choice as it is easy to work and is moderately decay resistant, especially if the wood is back-primed before installation. Availability of any specific wood will change annually based on market supply and demand. Chemically Treated Wood: Chemical wood preservative treatments are available to resist insect and fungal attack, but care should be taken to avoid using ones that may cause environmental or health risks. Borate preservatives can be applied to surfaces or injected to penetrate and protect the entire volume of the wood. Preservatives with zinc napthenate can be applied to the wood surface, where necessary, especially to protect hidden joinery and the end grains of wood. Water-repellants can also be used to help seal out moisture. Finally, primers and paints should be applied to both protect the wood and to maintain the historic character of the porch. Note that these treatments are different than those used on most pressure-treated wood, which is typically a plantation-grown southern pine of lower quality that is impregnated with chemicals. Pressure-treated lumber can be effective when used for hidden structural members like posts, joists and sills. However, because typical pressure-treated wood is very susceptible to the deterioration of checks, warping and splitting, especially when left unpainted, it is not a good substitute for the better quality wood that is needed for visible finish porch parts. For over a century, prefabricated architectural parts have been sold through catalogues or at home improvement stores. Some companies still make generic, stock architectural components in the same general sizes and designs as those that were first manufactured. These components can be available in both wood and substitute materials. Thus, it may be possible to replace a historic stock component, such as an architectural grade column, with a new prefabricated column that matches the original. Unfortunately, these replacement parts are not designed to match the historic parts of any particular porch. Because traditionally there were many different porch elements, a wide range of styles and considerable regional variations, stock replacement parts available today are not often found to match what is needed in a specific porch repair project. When faced with deterioration of a few porch parts, all the historic material should not be removed in favor of a readily available stock design that does not match the historic appearance. The expressed goal may be to create a porch with a “consistent look,” but this approach diminishes the building’s historic character and authenticity. A variety of modern materials are marketed today as a substitute for wood. They are usually composite materials typically in the form of plastic resins, including vinyl (PVC), fiber-reinforced polymers and polyester resin. There are other products on the market as well, including medium density wood fiberboard and composite fiber-cement boards. The market is ever changing with the introduction of new synthetic materials and the re-formulation of existing ones. The more costly synthetic products tend to offer the best potential for matching historic features while offering good durability. This means that potential cost savings over new wood tends to be more long term than immediate. Such products generally are not carried in local home improvement stores but rather are available from building supply companies or direct through catalog sales. The historical significance of a particular property and its porch influences decisions regarding possible use of substitute materials. In general, greater emphasis is placed on authenticity and material integrity when maintaining and repairing individually significant historic properties. However, a front porch that is repeated on rowhouses may be one of the defining characteristics of the historic district and thus of importance to the entire streetscape. So, too, can the location and appearance of a porch influence material decisions, as with, for example, a prominent front porch with ornate detailing as opposed to a small porch over a rear door. Thus, when the historic porch contributes to the historic character of a building, the particular substitute material that is being considered should accurately match the appearance of the wooden feature being replaced. Composite materials that can be routed or shaped in the field to match specific pieces being replaced have greater potential for use in repairing a historic porch. Materials that cannot be shaped to match the visual appearance of the historic pieces being replaced usually are not suitable for use on historic buildings. Substitute materials need to be finished to match the appearance of the historic elements being replaced. In nearly all cases, this means that the material should be painted, or where historically appropriate, stained as with some porch ceilings. While there are substitute materials being marketed as pre-finished with either a plain flat surface or generic wood-grain texture, select those that can be painted or stained in the field. When a substitute material is to be used in conjunction with existing or new wood material, it is important to consider the differences in expansion and contraction due to temperature and moisture changes. Before making a decision, it is also important to understand how a particular substitute material will age, what its maintenance requirements are, and how the material will deteriorate. For example, sunlight can break down exposed surfaces of plastic resins, so painting the surfaces is needed just as with wood. Low and medium density plastic foam parts are easily damaged by abrasion and physical damage, exposing the interior foam to weathering. Wood porches are just that, porches made out of wood, just as a brick houses are made of brick and cast-iron porches are made of cast-iron. The type of materials used historically in the construction of a building helps define its character. Limited use of substitute materials that closely match missing or deteriorated features may not endanger this historic character, but wholesale replacement with substitute materials usually will. Figure 12. This old porch enclosure, located on the back side of a house, has acquired significance over time and is remarkable both in the appropriateness of its detailing for use by others today, as well as its high degree of maintenance. The enclosure is set behind the columns; the balustrade has been retained; and the light divisions and the size of the glass panes echo that of the windows above. Within each bay there are two well-crafted, inward swinging doors, providing for greater seasonal use of the porch. Photos: Charles Fisher. Much of the character of a historic open porch is clearly its openness. Therefore, in most cases, a historic open porch should not be enclosed. If a porch enclosure is being considered, its significance and location—as well as the nature of the planned enclosure—play key roles in whether it can be done without changing the porch’s and building’s historic character. While it is almost never appropriate to enclose a front porch on a historic building to create interior space, enclosing a less prominent porch on a less visible elevation could have less impact. 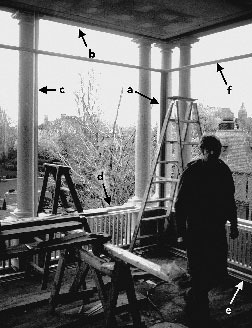 In addition, an enclosure should retain as many of the historic porch features as possible (Figure 12). Traditionally, the seasonal use of porches was extended with screens and awnings. 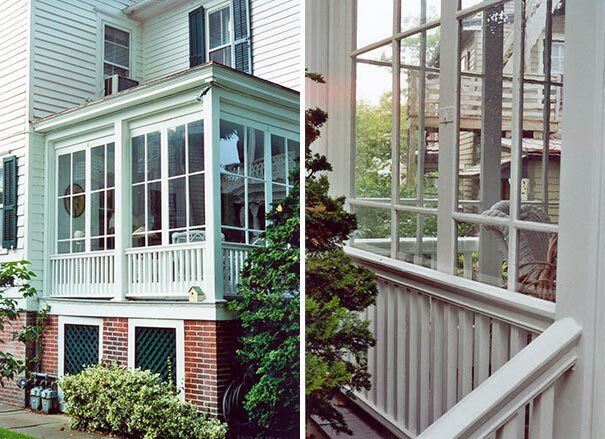 Screened porches have been popular since the advent of inexpensive and durable wire insect screening in late 1800s. Screens were often set unobtrusively behind railings and columns so the decorative components of the porch remained prominent and visible. Since screens can be damaged easily, the screening material was often set in slender, easy to repair, removable wood frames that could be installed during the warmer months, and stored in the winter. When screening a porch today, this historic precedent is recommended. Screened panels should have minimal wood framework painted either to match the porch or in a darker color to make the framing less visible. Decisions on whether screens should be installed inside the porch railings and posts, between the posts, or on the outside will depend on local traditions and on the design of the porch and trim. Screen doors on porches should be sized to fit proportionately with the porch, made of wood, and hung to swing out so insects are not brought inside with use. Awnings, drop curtains, and valances were common porch accessories during the nineteenth and well into the twentieth centuries. Both functional and decorative, these canvas features helped shield porches from the sun’s direct rays, while their colorful stripes embellished and complemented the house’s exterior. Some awnings were fixed in place; others were of a roller assembly that allowed owners to easily lower or retract the awning, depending on weather conditions. Today, modern solution-dyed acrylic fabrics—materials that resemble, but are more durable than canvas—are often used on porch awnings and drop curtains. When new awnings are installed on a historic porch, the selected awning should be appropriate in shape, material, size and color. 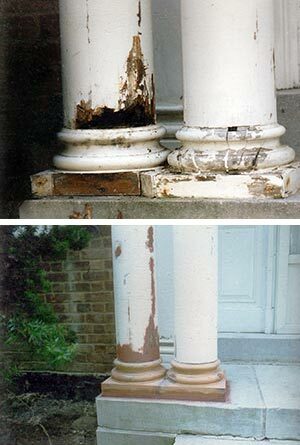 Care should be used not to damage existing historic porch features such as columns or cornices. Figure 13. Particularly in New England, there is a cold weather tradition of installing temporary glass and wood panels at entrance doors, thereby creating an enclosed vestibule. These enclosures with their small divided lights were generally removed in the spring. Photo: John Leeke. Temporary enclosures allow a porch to be used in colder months while not permanently altering its appearance. In fact some have become historic features of buildings. Particularly in New England, there is a continuing tradition of installing relatively substantial glass and wood panels on porches during the winter, especially around an entrance door. These tended to have small divided lights. Sometimes porches were fully enclosed with a divided light glass door for entry, creating an enclosed vestibule that reduced the amount of cold air entering the house when the door was opened. Others consisted of simple sidewalls perpendicular to an existing entrance door, serving as a windbreak. Such enclosures were generally removed in the spring (Figure 13). In recent years, some porches have been enclosed during the winter with plastic sheeting (polyvinyl) for perceived energy conservation or for creation of an enclosed space. Such a treatment generally diminishes a building’s historic character and is not recommended for highly visible porches. Enclosure of a historic porch can result in significant changes in the appearance and character of the building. When considering the possible enclosure of a porch, a number of questions and concerns should be successfully addressed. Is the porch on a significant elevation of the building? A porch on a prominent elevation was there to be seen and its open qualities are visually important. Enclosing such a space should be avoided. Figure 14. The enclosure of a prominent porch can dramatically change the historic character of a building. The L-shaped porch on this 1896 Shingle-style New England residence was later enclosed with aluminum windows and screens. Recent owners elected to reopen the historic porch. Among the other work, it was necessary to correct structural damage, as with this post, where beneath the wood casing carpenter ants had done serious damage. In reopening the porch, the historic character of the residence has been brought back and the traditional use of the porch is once again enjoyed. Photos: Mark Landry, Landmark Services. Is the enclosure necessary? An enclosure will undoubtedly change the porch as a historic feature and may result in damage or loss of historic materials. Depending on the significance of the porch and the nature of the building, a new porch enclosure may also change the historic character of the building. Consideration should be given to alternate solutions such as recapturing underutilized space in an attic or basement (Figure 14). Is the porch a highly distinctive feature of the building? Even porches on secondary and rear elevations can be distinctive, such as a two-story porch on the side ell of a farmhouse. Porches ornamented with decorative trim that embellishes the house can also be distinctive. Enclosing these features should also be avoided whenever possible. 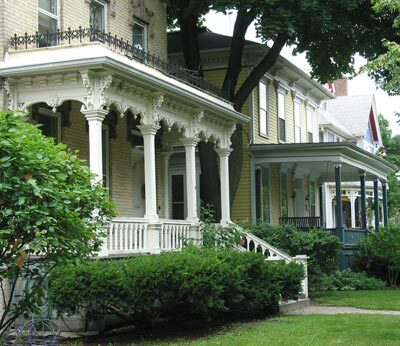 Is the porch a feature repeated on a row of buildings in a historic district? Open front porches on a block of row houses can be not only important to an individual building but can also make up a significant feature of the streetscape. Enclosing such a porch usually is inappropriate even if a porch on an adjacent building already has been enclosed. Will the proposed enclosure encompass the entire porch? History has shown that the enclosure of a portion of a porch on a secondary elevation does not always alter the character of a building. In the past as indoor plumbing was introduced to old buildings, the partial enclosure of a one or two-story porch on a secondary elevation was a convenient means of providing new bathroom space while limiting disruption to the building’s interior. Since early bathrooms were traditionally small in size, most of the existing porch could be retained as open space. It was common to create new walls set either between columns or behind them, since the columns usually served a structural as well as decorative purpose. Where sleeping porches with full-length louver shutters were present, the new wall could simply be set behind and the shutters retained and fixed in place. In both cases the resulting effect minimized the impact of the partial enclosure on the appearance of the building. This also provides us with an approach that may be appropriate for a particular project today. Will the enclosure result in the loss of considerable historic fabric? Unless the historic porch is so deteriorated that it is beyond repair, any consideration of enclosing all or part of a porch should incorporate retention of historic fabric. This may mean that the existing structural system needs to be augmented but generally not replaced. Distinctive features such as columns, brackets and balustrades should be retained and the new wall set behind them. Is the foundation adequate for the enclosure of the porch and the new use of the space? Porches were often built on simple posts or piers, some with only minimum footings. Such structural supports may be inadequate to carry the added load of the proposed changes and the typical low space beneath a first floor porch may make installing a new porch foundation difficult and expensive. Such installations may result also in an extensive loss of historic fabric. Figure 15. A traditional technique of porch enclosures still used today involves the insertion in each column bay of one or more glass enclosures set in wood frames . This enclosure is properly set back an entire porch bay from the front of the house and utilizes traditional light divisions and wood frames. The balustrade, added here for illustration purposes, shows the importance of retaining this linear feature within the enclosed bays. Photo: Charles Fisher. How will the proposed enclosure be viewed from the outside once the interior space is furnished? One of the approaches to enclosing a porch is to utilize near full glazing set behind existing columns in an attempt to retain a feeling of transparency. Whether such a treatment is successful depends on how it will look once it is constructed and how will the appearance on the outside be impacted by interior lighting, mechanical systems and furnishings. The traditional use of plantings and porch awnings for shade also provided extended privacy. If historically appropriate, an existing or new awning and plantings may help to reduce the impact of a porch enclosure on a secondary but visible elevation. Is the design of the proposed porch enclosure in keeping with the historic character of the building? Where the enclosure of all or part of a historic porch is appropriate, the selection of a compatible design and materials is important. Windows, doors, and wall material selection, along with how the new infill fits within the existing porch, are all factors to consider. A traditional technique of porch enclosures still used today involves the insertion in each column bay of one or more glass enclosures set in wood frames. The enclosures are located between or behind the columns, depending upon the nature of the porch, and mimic the pattern or size of glass panes found in historic windows on the building (Figure 15). An alternate treatment involves the use of much larger sheets of clear, non-reflective glass recessed behind the porch supports, balustrade and railing. This more contemporary treatment may be appropriate, depending upon the historic character of the building, location of the porch, and other factors (Figure 16). Windows, doors, and wall material selection, along with how the new infill fits within the existing porch, are all factors to consider. Figure 16. The use of near full glazing to enclose a porch may be appropriate depending upon the historic character of the building, location of the porch, how the interior space is to be treated, and other factors. This enclosure of a rear porch to create a conference room successfully utilizes large expanses of glass and narrow metal framing set behind existing porch elements (a through e). Where an additional horizontal support was needed (f), the frame was placed at a Location that is found in many traditional insect screen enclosures. Photo: Charles Fisher. There are many building codes used by states and municipalities across the nation, with a majority of their requirements being very similar and focused on new construction. Building codes such as the International Building Code and its companion, the International Existing Building Code, have been developed in recent years that are generally much more sensitive to existing and historic buildings, emphasizing the retention of historic fabric without jeopardizing life safety. These “proportional codes,” as they are called, allow building inspectors greater flexibility to make decisions based on the specific circumstances of each building, and the type and extent of work planned. Successful rehabilitation work achieves a balance between building and safety code considerations and the retention of historic design and materials. The porch is no exception. The most common porch elements affected by code requirements are railing/balustrade height, baluster spacing, stair geometry, and structural system. When a historic porch is so deteriorated that a substantial portion must be replaced, modern building code requirements are usually triggered. These requirements are often more stringent for multi-family or commercial structures than single-family houses. Figure 17. The porch's structural system must be capable of supporting today's loads. In this case moisture led to the deterioration of the wood girder at the corner, creating a major structural deficiency (top). A new solid timber was installed to replace the girder (middle); alternatively a built-up girder could have been used since a fascia board would conceal it. The column base was repaired and portions replaced and the balustrade and column reset and secured (bottom). Photos: Paul Marlowe, Marlowe Restorations. It is important to ensure that the code-required work be done in a manner that is sympathetic to the historic character of the building. If building code requirements threaten the historic character of the porch, alternatives that reconcile the two should be explored. Many local jurisdictions issue waivers or variances for historic buildings, allowing for historic elements to be retained, when it can be demonstrated that safety will not be compromised. In the event that an alteration to a historic porch is required to make the porch safe to use, care should be taken in planning and undertaking the work. Fortunately, there are usually a number of options that are possible, although one is usually the most appropriate preservation solution. Ensuring that the structure’s foundation can support the specified load is a primary safety issue for porches. Fortunately, repairs and upgrades to improve structural stability are generally made to the foundation at or below grade, and can usually be concealed under the porch or behind finish details. Weakened joists can often be strengthened with the addition of sister joists, epoxy structural repair, or the insertion of new concealed structural members (Figure 17). Historic stair risers are sometimes too steep and treads too shallow to meet contemporary building codes or the special needs of the occupants. In the latter case, the addition of a simple handrail that meets code may suffice. In instances where there is another stairway that meets code, for example a side stair, it may be possible to retain the existing non-conforming historic stairway. Modifications to bring porch stairs into conformance with code can be difficult. Where buildings are set close to the street, it may not be possible to rebuild the stairs in the same direction to meet code if they will have to extend onto a public sidewalk. Unless a variance is obtained, it may be necessary to turn the stairs to be parallel rather than perpendicular to a building. Where wood stairs need to be rebuilt, the historic finish details, such as moldings, cut work and edge detailing, should be reflected in the new construction. One common mistake is the replacement of wood stairs or brick steps with concrete, a material that may not be in keeping with the historic building. Figure 18. 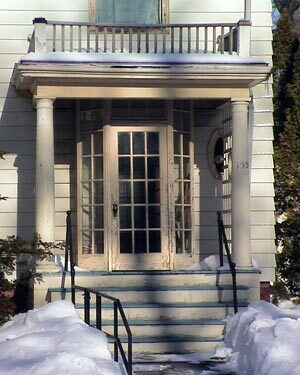 When a porch is used as a wheelchair accessible entrance, it may be possible to retain the historic stairs by adding a ramp parallel to the building. Through plantings and some re-grading, the new ramp built parallel to the building (left) allows retention of the historic stairs and does not impact the historic character of the entrance (right). Photo: Iowa State University Extension. Where a porch must be used as a wheelchair accessible entrance, two general issues arise. If there is an elevation difference greater than ½- inch between the porch deck and the front door threshold, a simple threshold ramp may suffice. In cases where the elevation difference is larger than can be accommodated by a simple threshold ramp, a level platform with sufficient turning radius at the door for a wheelchair may be necessary. The other issue is devising a means for wheelchair access from the grade to the porch deck when the porch is the only entrance alternative. It may be possible to retain the historic stairs by adding another entrance to the porch with the construction of a ramp parallel to the building (Figure 18). Codes generally require for children’s safety that new balusters are spaced such that a four-inch sphere cannot fit through. Vertical balusters on older porches are often spaced farther apart than this. If modifications are required, inserting narrow metal rods between the existing balusters may be a compatible and inconspicuous solution, particularly if painted flat black or another dark color. This is generally preferable to moving the balusters closer together or adding more balusters to fill the gaps. Historic porches generally have handrails that measure 28 to 30 inches in height from the floor. Current code requirements for new construction generally mandate that railings be 36 to 42 inches in height (often 36 inches for single family dwellings, and 42 inches for multi-family dwellings and commercial buildings). Raising the historic railing by as much as 30% or more can have a major impact on not just the proportions of the balusters, but also on the overall appearance of a historic porch. Adding a simple rail above the historic railing and painting it to hide its presence as much as possible is generally the least intrusive solution when this safety requirement must be met. Similarly, an existing bottom rail is sometimes set too high off the deck to meet contemporary code requirements. The addition of a simple wood rail or even a narrow metal pipe below the bottom rail will usually suffice (Figure 19). Figure 19. Historic porches generally have railings that measure 28 to 30 inches in height from the floor. When additional height is necessary for safety, a simple rail, added for illustration purposes in this photograph, can usually be installed above the historic railing. Not only does this treatment allow retention of the historic balustrade, but it also has a minimum impact to the appearance of the porch. Photo: Charles Fisher. It is not uncommon to find historic porches with decks only several steps off the ground and with no railings. 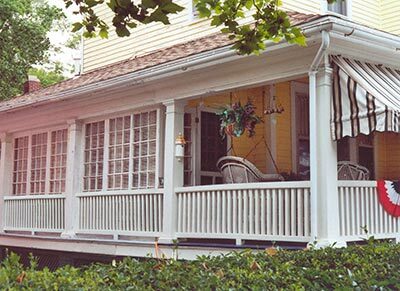 For owner-occupied residences undergoing rehabilitation, local codes usually will not require the addition of railings to these existing porches, provided the porch deck is below a certain height off the ground—typically from 18 to 24 inches. Where greater safety is warranted even though no railing is required, alternatives such as planting an adjacent hedgerow, installing planter boxes between columns, or raising the grade are worth considering. Where not practical or acceptable, a railing might be added so as to not noticeably impact the appearance of the historic porch. Any solution, however, should be simple and based on the character of a specific porch, and its appropriateness considered on a case-by-case basis. Wood porches have made an enduring contribution to our built environment. Porches are significant because of the special character they impart to a historic building and their role in our social and cultural history. A porch is an open sheltered part of a building, providing a covered entrance and, where larger, serving as an outdoor activity room. It represents an outward extension of a building, a place guests can initially be sheltered from the weather, even welcomed and entertained. Like all historic building features, wood porches require routine maintenance to prevent decay. Understanding how a porch is put together and the factors that cause deterioration will help considerably in carrying out both maintenance and needed repairs. Regular maintenance pays off not only with a good appearance but also by reducing the need for future repairs. With both maintenance and repairs, emphasis should be placed on preserving the historic fabric and significant features of a porch. Where components are deteriorated beyond repair or missing altogether, new pieces should be installed that match the historic ones. Fortunately, good craftsmanship and the use of quality replacement materials as needed will be rewarded with repairs that last. Attentive care will result in the historic porch retaining its charm both in appearance and in function. John Leeke is a Preservation Consultant in Portland, Maine; Aleca Sullivan is an Architectural Historian in Evanston, Illinois. Numerous individual generously provided their time and shared their knowledge in making this Preservation Brief possible. Thomas D. Visser, Historic Preservation Program, University of Vermont, deserves special recognition for his insightful contributions. Also gratefully acknowledge for their assistance in reviewing this publication are Neal A. Vogel, Restoric LLC and Judith L. Kitchen, Ohio State Historic Preservation Office. Thanks go to Marilyn Kaplan, Preservation Architecture, for her contributions to the code section of this publication. Special thanks also go to the following staff of the National Park Service’s Technical Preservation Services office for their review and assistance: Sharon Park, FAIA, Michael Auer, Anne E. Grimmer, and particularly to former staff Kay Weeks. Thanks also go to Chad Randl, Kaaren Staveteig and Liz Creveling of the National Park Service’s Technical Preservation Service for their assistance and to Peter de Paola, Mark Landry of Landmark Services, and Paul Marlowe of Marlowe Restorations. This publication was under the technical and editorial direction of Charles E. Fisher of the National Park Service’s Technical Preservation Services whose considerable contributions, including that of the section on new permanent enclosures, helped made this publication possible. This publication has been prepared pursuant to the National Historic Preservation Act, as amended, which directs the Secretary of the Interior to develop and make available information concerning historic properties. Comments about this publication should be addressed to: Charles Fisher, Technical Preservation Publications Program Manager, Technical Preservation Services—2255, National Park Service, 1849 C Street, NW, Washington, DC 20240. This publication is not copyrighted and can be reproduced without penalty. Normal procedures for credit to the authors and the National Park Service should be provided. The photographs used in this publication may not be used to illustrate other publications without permission of the owners. Davis, John Michael. “Exterior-Trim Details That Last,” Fine Homebuilding, August/September 2001. Fisher, Charles E. and Hugh C. Miller, eds., Caring for Your Historic House, New York, NY: Harry N. Abrams, Inc., 1998. Kitchen, Judith L. Caring for Your Old House: A Guide for Owners and Residents, Somerset, NJ: John Wiley & Sons, Inc., 1991. Leeke, John C. Practical Restoration Reports Compendium, Portland, ME: Historic HomeWorks, 2005. Nash, George. “Renovating Old Porches: Common Problems Can Be Solved With Simple Repairs,” Fine Homebuilding, July 1982. Preservation Briefs, Washington, DC: National Park Service, Technical Preservation Services: 1978–present. Preservation Tech Notes, Washington, DC: National Park Service, Technical Preservation Services: 1984–present. Reed, Douglas C. “Detailing Early Porches,” Old House Journal, May/June 2001 and July-August 2001. Visser, Thomas D. Porches, Piazzas & Verandas, forthcoming. Weeks, Kay D., and Anne E. Grimmer. The Secretary of the Interior’s Standards for the Treatment of Historic Properties with Guidelines for Preserving, Rehabilitating, Restoring & Reconstructing Historic Buildings, Washington, DC: National Park Service, 1995.